It has become tradition that every American president opens his own library and museum in his home town as a, most often, glowing tribute to his years in the White House. In Los Angeles, there are two such presidential libraries, in completely different parts of the vast city – Ronald Reagan in Simi Valley in the north, and Richard Nixon in Yorba Linda in the south. It’s possible to visit both in one day, with a little luck with the traffic, by jumping from freeway to freeway, straight through Los Angeles’ downtown. The Reagan library, high on a hill — in the middle of nowhere — with sweeping views of the neighborhood and its treeless, sunburned hills, is such a glowing tribute, only bigger and more glowing than usual – with a statue of Reagan as a cowboy, a piece of Berlin Wall, antique cars, and his old plane, Air Force One, as part of it all. Not a bad word. Reagan’s memory is to be cherished. The Iran-contra scandal, for example, now mentioned in passing was not mentioned at all for a long time. It describes in direct terms, without excuses, how Nixon set the stage that would lead to the Watergate scandal, with Donald Segretti’s “dirty tricks” and the “plumbers” and G. Gordon Liddy, which were followed by the break-in at the Watergate on June 17, 1972, and, ultimately, Nixon’s resignation on August 9, 1974. “Our long, national nightmare is over,” said his successor Gerald Ford. ”The library has a nonpartisan mission, it’s a nonpartisan federal institution, and it has an obligation to provide exhibits that encourage the study of history”. The Reagan Library has become a place of pilgrimage for America’s conservatives. They have never made a pilgrimage to Yorba Linda, and will probably never do so. 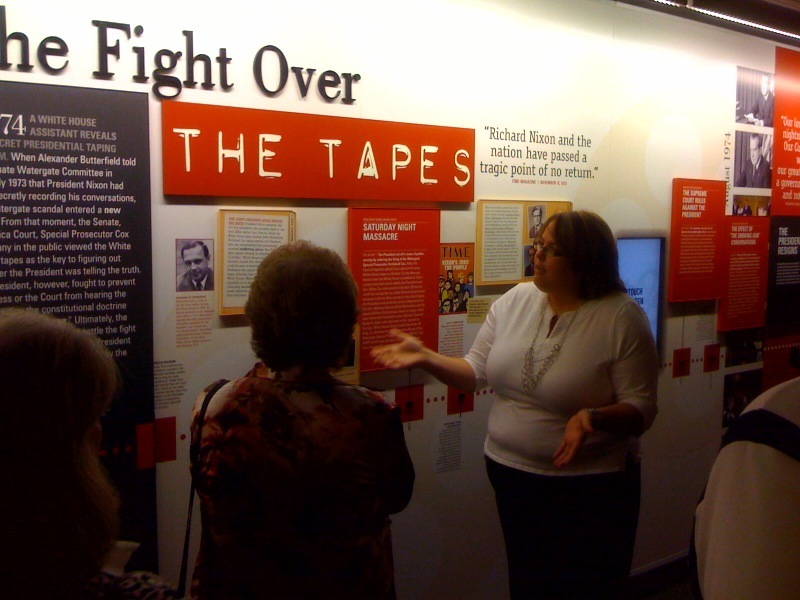 But let us hope that all who are interested in American modern history pay a visit to the Nixon Library. It’s well worth the time. This entry was posted in Cities, History, Museums, Politics, Travel and tagged America, History, Los Angeles, Politics, Presidential libraries, Richard Nixon, Ronald Reagan, Watergate scandal. Bookmark the permalink.